The city of New York does not conjure up phantasmagorias of geology. A densely packed space, not much of the earth’s crust is visible on the surface of the city. In Manhattan, one can go weeks without seeing so much as a park. Central Park is one of the only places where the natural state of New York is exposed. Those rocks are remembered more fondly as a childhood climbing ground, than any sort of window into the past of the formation of the Earth. Yet the type of rock that makes up Manhattan Island is more intrinsic to its existence than anything else. Without Manhattan’s stable bedrock, the looming skyscrapers that are often conceived of as an integral part of its identity would not be supported enough to exist. It is interesting to consider how the formation of this particular part of North America, molded by the same processes as the whole globe, created such a unique city that is known for so many other things besides its geologic makeup and history. The Taconian Orogeny, which occurred approximately 450 million years ago during the Middle Ordovician Time Period, is responsible for the formation of Manhattan, along with the creation of the Taconic Mountains and the deformity and metamorphosis of the rocks of southeastern New York (1). The Taconian Orogeny was a continent building event that occurred when the landmass we now consider North America and a volcanic island arc collided, and North America began to be subducted (or pulled under) the volcanic island arc. Volcanic “island arcs are volcanic islands that form parallel to ocean trenches in subduction zones.”(2). The volcanic island arc formed because of increased volcanic activity due to the plate tectonic movement that would go on to create Pangaea (3). Because of the immense amount of pressure being exerted on the rocks that made up North America during this partial subduction, they metamorphosed and folded together into the beginnings of the metamorphic rocks we know today. Metamorphic rock is one of the three major types of rock (the two others are Sedimentary and Igneous.) Metamorphic rock forms when any of the various types are subject to immense amounts of pressure and incredibly high temperatures that literally transform them into a new type of rock. Shale became schist, limestone became marble, and both were folded in with the granite gneiss that had already formed a billion years ago during another rock building event called the Grenville orogeny. In the present, Manhattan is formed by three warped strata (layers of rock) that fold into each other. The next event in New York City’s formation was the Acadian Or ogeny, which occurred when North America collided with Avalon, a smaller continent, and they stuck together (4). Many more collision events happened to North America over the years, including the eventual formation of Pangaea, a global supercontinent, and its consequent stretching and pulling apart, each further deforming the rocks. Each of these events drastically twisted and upturned the rock layers to the point that is it very difficult to tell what collections of rocks and distortions belong to each event. The primary three strata, or layers of rock, (that I mentioned earlier) that form Manhattan are the Manhattan Schist, the Inwood Marble, and the Fordham Gneiss. Figure 1 gives you a bird’s eye of the surface distribution of these three types of rock in most of Manhattan. The yellow represents the Inwood Marble, the red represents the Manhattan schist, and the blue represents the Fordham Gneiss. Allochthonous Rocks are rocks that have been moved from their site of creation, while Autochthonous Rocks are rocks that are still in their original site (even if they have been eroded and deformed since then.) Although only a sliver of blue is visible on Manhattan in this map, as you can see it reappears on the opposite side of Queens, which purely from this map, implies that the gneiss seems to be at the bottom of the East and Harlem River. 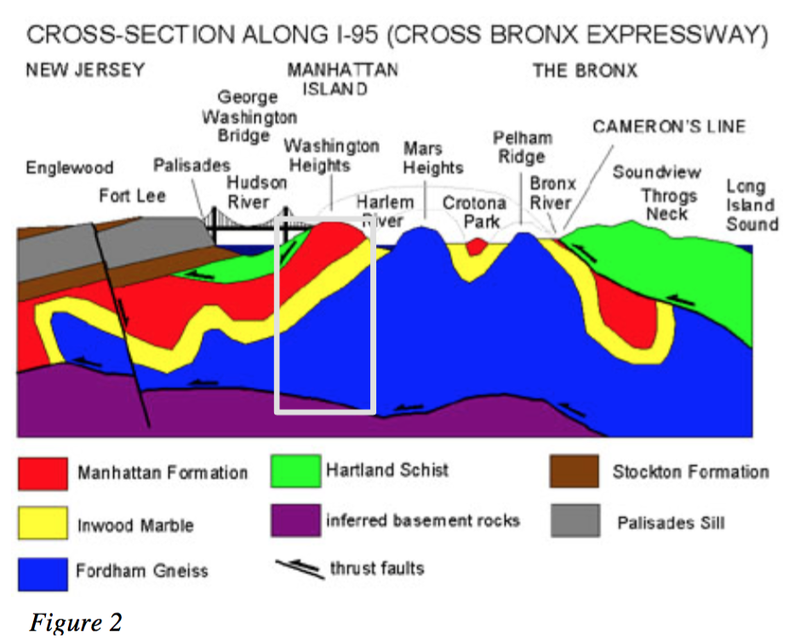 This opinion is supported by the next Figure (2), which displays a cross section along the top of Manhattan of the make up of the various rock layers. It is fascinating to see the layers extending into New Jersey and the Bronx (Manhattan is represented in the light gray box. Also the gneiss that so little can be seen of on the surface forms the majority of the rock in the area. The hilly formations that one might notice in Figure 2 are due to erosion between periods of glaciation.5 The Inwood Marble, by far the thinnest layer, is the softest rock and therefore the most susceptible to erosion. The Inwood Marble is responsible for many of the rocks I scrambled over as a child and napped on in the sun. The only fossils to be found in New York City are in museums: fossils can only form in sedimentary rock and Manhattan is made up of metamorphic rock, which has been compressed to the point that any fossils that once could have been found are now gone. Geology is of special importance to New York City because of the knowledge required of it for engineering. The strata began to be uncovered in the area with the 1817 construction of the Erie Canal (6). Because New York City is in a constant state of construction, endlessly building new subway lines and high-rise foundations, it has a unique opportunity to keep track of the strata. Askins and Grevin put forward a proposal to establish a repository of the metropolitan subsurface geology, which in their opinion is useful not only because of the geohistory of Manhattan that it paints a picture of, but because it gives them a working picture of how rocks are being affected in the short term (7). There is a current debate going on about the extent to which the depth of Manhattan’s bedrock has actually affected its skyline, but it is safe to say that without the metamorphic makeup of the bedrock, which has already been subjugated to enormous pressure and completely compressed, Manhattan would not be able to support its skyscrapers without the rock shifting around. Manhattan’s close relationship with its rocks has been far more influential than just its visible Central Park climbing rocks would imply. But scrambling over rocks is pretty fun. 1 Isachsen, Yngvar. W. Geology of New York: A Simplified Account. Albany, NY (89 Washington Ave., Albany 12234): New York State Museum/Geological Survey, State Education Dept., U of the State of New York, 1991. Print. p. 50. 3 McCully, Betsy. “New York Geology.” New York Geology. N.p., Aug. 2011. Web. 16 Nov. 2014. <http://www.newyorknature.net/Geology.html>. 4 Isachsen, Yngvar. Ibid. p 50. 5 “Geology of National Parks.” Geology of National Parks. N.p., n.d. Web. 16 Nov. 2014. <http://3dparks.wr.usgs.gov/nyc/highlands/manhattan.htm>. 6 Isachsen, Yngvar. Ibid. p 240. 7 Dennis, Askins H., and Grevin J. Frederick. “Proposal to Establish a New York City Soil and Rock Core Repository Representative of Metropolitan Subsurface Geology.” Northeastern Geology and Environmental Science 26.1-2 (2004): 2-4. GeoRef. Web. 16 Nov. 2014. <http://www.geocities.com/northeasternscifdn/>. 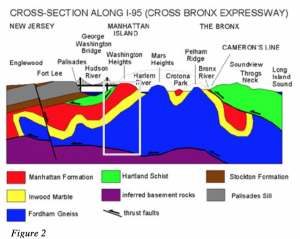 “Geologic Map of Northern Manhattan and the Bronx.” USGS. N.p., n.d. Web. 16 Nov. 2014. I am an Assistant Professor of Geosciences at Williams College. My area of research is in paleontology and geobiology, most of the time focusing on the evolution of life during the Proterozoic time period.